CarbonZone has over 10 years experience of delivering creative, commercially efficient compliance solutions to Environmental Legislation in the UK. We offer an integrated CRC compliance solution which gives you peace of mind that you have met the legal requirements, whilst tapping into the more strategic compliance services offered to reduce your carbon emissions. CRC takes environmental compliance to board level helping you gain competitive advantage, cost savings and positive positioning in the developing low carbon economy. The CRC Energy Efficiency Scheme is a new, mandatory UK energy saving and carbon emissions reduction scheme starting in April 2010. The scheme is central to the UK’s Climate Change strategy and focuses business on improving energy efficiency and reducing Carbon Dioxide (CO2) emissions. Designed to raise awareness of energy management amongst non energy intensive businesses, CRC encourages positive changes in business 'best practice' and employee behaviour and other stakeholders' behaviour. The CRC Efficiency Scheme will engage all UK Government Departments and Local Authorities mandated by the Secretary of State, and the board rooms of initially around 5000 private sector businesses likely to become ‘Full Participants’. These businesses will have to purchase and trade annual ‘carbon’ allowances, with the most efficient and pro-active companies reducing their allowance purchases year on year and also benefitting from relative increases in base recycle payments and increasing Performance League Table bonuses. On the other hand, poor performing Participants may require to purchase increasing allowances and will be financially penalised by the Performance League Table mechanism. A further 20,000 (estimated) organisations will have annual information disclosure obligations under CRC. Is My Organisation Obligated under The CRC Efficiency Scheme or "Am I in?" If your organisation, during 2008, had one or more half hourly electricity meter (HHM) and the total (inclusive) half hourly electricity supplied through those meters was 6,000 Megawatt hours (MWh) or greater, you will have to register as a Full Participant. If your organisation, in 2008, had one or more HHM but consumed less than 6,000 MWh for the whole year, you will have to make an Information Disclosure, the extent of which is determined by your annual electrictity consumption. When does the CRC Efficiency Scheme Start? Registration starts in 01 April 2010, registration details will be submitted to the scheme Regulator. Phase 1 is an introductory phase running from 01 April 2010 to 31st March 2013. 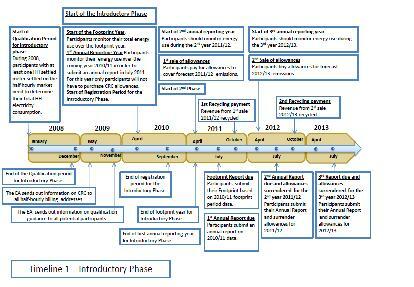 Subsequent Phases will run for periods of 7 years. There will be a number of Scheme operational changes relevant to Full Participants during Phase 1 and into Phase 2 based on performance metrics and allowance pricing. Identify your energy consumption for the period of 2008 with specific electricity consumption. You can request this information from your energy supplier. Identify and chart your organisational structure identifying the total organisational structure under a defined Parent Organisation. The Scheme is a Mandatory Scheme, and companies found not to be compliant face onerous and cumulative financial penalties / fines. CarbonZone have over 10 years of experience within the Environmental and Low Carbon Sector working specifically with both International Blue Chip Organisations and SME's, assisting them with the development and delivery of compliance strategies to complex environmental legislation. With our national network of trusted and experienced business professionals CarbonZone have the knowledge and expertise to deliver best practice solutions which deliver real costs savings and competitive advantage whilst mitigating against the real risks which face Organisations as the Business and consumer culture changes towards a low carbon economy. CarbonZone can assist your organisation with creation of the right strategy to ensure you are CRC compliant, that you can benefit financially from the implementation of CRC and remain ahead of your competition. We plan to offer compliance packages for those Participants who wish to assign an ‘Agent’ to manage the CRC administration process or go a step further and outsource the management of CRC, measurement and reporting within their organisation. For more information please contact one of our experts at CarbonZone on 01294 475 664 or email us at crc@carbon-zone.com or visit our website at www.carbon-zone.com. The CRC Energy Efficiency Scheme is only the start of the UK’s low Carbon ‘revolution’. Be at the forefront with CarbonZone. The Government plan to implement the CRC in different phases and the following summarises the key dates and tasks to look out for.